I am not quite finished. The Plexiglas was the most expensive item on the entire cab. One sheet of .200 thickness Plexiglas (4x8) cost $160.00 at Menards. I cut it into three pieces, which covered the front windshield, back window and right side. I went with the thinner stuff (to save some money) for the left (door) side. That was around $80.00 for two pieces. The cab has a lot of glass area because when operating a tractor, I like to see the bucket, front tires, etc; especially when working along an open hole. 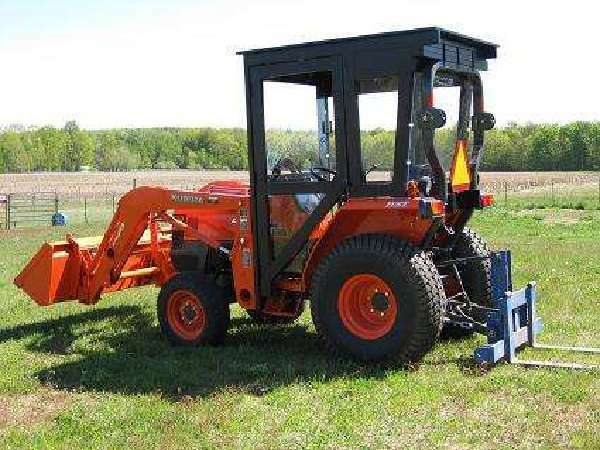 The cab from Kubota is approx $5,000. and a Curtis aftermarket cab is approx $3200 with soft sides. The soft does not work along the northern Michigan shoreline (where I am) do to the intense winds. The winds ripped and distorted my other soft cab and bent the framework. This is my redneck cab that is built out of construction grade lumber. If money was not an issue, I would build a cab out of finish oak lumber, use spindles and scalloped fancy moldings to compliment the finish look. I would design more curves and angles to make it look unique. However, using heavy construction grade lumber limits the amount of curves you can create. I made this cab solid and tried keeping expenses down. The front 2x6 is bolted to the back of the bucket arm support through existing holes. I did not drill any holes in the tractor or ROPS. 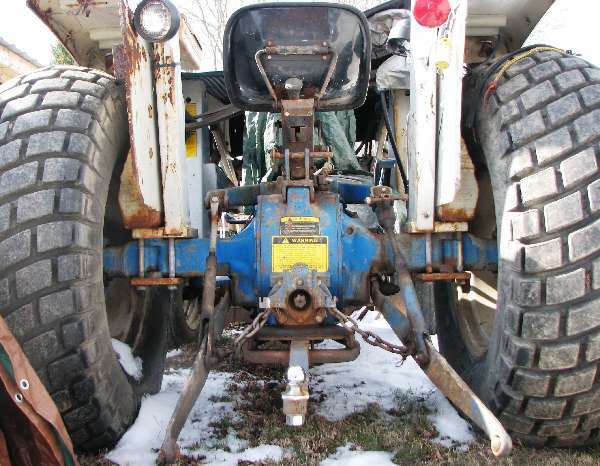 I used U-bolts and clamped it to the ROPS so the cab actually sits on 2 - 2x8 pieces which holds the cab off the fenders and allows it to flex with the movement of the tractor. Before I put the glass in, I took the tractor out and dug, went over some bumps and lifted the front wheels off the ground with the bucket to make sure the cab will flex with the tractor movement. It seems to be holding up - at least for now. I could have installed the Plexiglas like you would a house window with moldings but used mirror holders instead. This way if I get a hot day and want to take the glass out, I take my cordless screwdriver, take out a few screws and the glass comes right out. I still have some rubber molding to install that will fill the gaps around the fender areas and the door. I built it extra tall ( I am 6-3) so I can get on and off without bumping my head. The spare pieces of Plexiglas were used to fill in the small areas in the lower front areas of cab and behind the seat, which will aid in blocking those winter winds. The cabs purpose is to block the wind and was not designed to be air tight, nor did I plan to heat it. I only want a wind block. I am ordering the orange plate with black letters that reads "Kubota" which will tie in the orange tractor and black cab and will be placed on the header over the front window. I designed the right side window (passenger side) to slide so I can open the window and get to the bucket and rear three point controls while standing outside. Often when working you need to operate the bucket or rear lift while off the tractor. The access door is lightweight and can be locked in the open position. The plexiglass actually extends beyond the door frame which covers the areas that appear open by the fenders. The rafters are a foot apart with 3/4 inch exterior plywood roof. I installed some metal brackets that will hold a cloth covered 2x4 across the inside of the front windshield in the event of transport. This helps support the large piece of glass when transporting on a trailer and traveling down the road over 55 mph. I designed the cab as I went, working on it a few hours as I found time in between homework and everything else. The cab is not as attractive as Kubota's but it does work. Grayfox, thank you for posting. I like seeing someone think and do. Looking at your pictures of the snow is a very wise project. As a person who enjoys wood working like the thoughts of the oak spindles. It does made me think of some horse carriages due to the shape and color. Why don't you check on an add on heater? Be careful hoses are not where they would wear. On the humorous side and hope it does not happen...if stolen it will be easy to identify. Also you have a good bit of pictures posted of it. Might wanna get Terminex to spray around it once a year though. The winds here are to fierce for termites. even though it was anchored in the ground. The 2nd one I anchored three feet deep so it could not tip over. The wind spun the prop so fast it literally broke it off. This was a heavy duty ten foot tall windmill. Our house sounds like it is in the middle of a vortex in the winter. My last tractor had a factory soft cab and the wind bent it, tore it to the point I had to use stiff bungy cords to keep the doors shut. Jeff, I knew you were envious of his cab. Made you think of the curtains you wanted when on the Gulf Coast didn't it? Are you loaded heading back there for clean up if the oil hits? GrayFox, hard to believe it can be cold enough anywhere to stop termites or fire ants. I prefer the termites. I remember reading somewhere about yout winds off lake Michigan were ideal for the big generator windmills till some seagull lover group got them put on hold because too many gulls were flying into the blades and getting killed. Just wondered if they ever got that resolved. Thanks for telling and showing. I'm impressed! Let us know how it works next winter. If you want a minor suggestion, I'd be concerned that a coating of frost could make it useless. You could install a 12v outlet so you could plug in a fan. If you can find or make a manual windshield wiper, that might be a worthwhile and low-cost addition for front and back. It might be simple to run a hose from the engine area to let some of that heat in. You could carry a spray-bottle of frost-cutter after you try it on some scrap plexi. And you could cut out eye-level, drop-down ports in the plexi so if worst came to worst you could see where you're going. more windmills and the bigger ones with the heavy duty blades do not seem to be affected by the birds.